We berthed on the opposite side of the harbor from Vancouver, so we stayed on board during discharge operations. 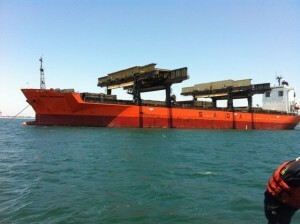 There was a car carrier berthed next to us which was discharging massive mining equipment and cranes. 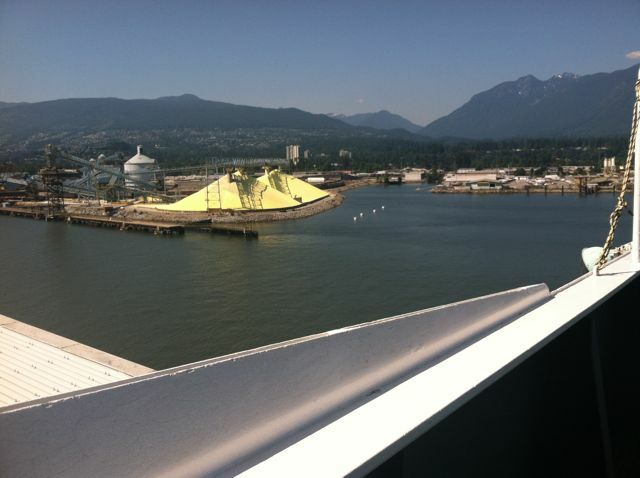 We finished discharging the remaining steel products at 0900 hours and so our stay in Vancouver was brief. The pilot boarded around 1300 hrs and set sail back to Long Beach. Heading back to Long Beach, the crew had the massive task of preparing the holds to be able to load a cargo of Borax, which is a fine powder. We were warned that the cargo hold inspectors would be incredibly strict with their inspection. The voyage down to Long Beach was uneventful and probably not sufficiently long enough for us to buff the holds ready for inspection. When we arrived into Long Beach again late at night, we anchored in the inner anchorage and promptly had all holds failed! Shore gangs were hired to help with the cleaning. They were on board 24hrs taking 12-hour shifts. I stayed on board for another couple of days before Dad flew over from the East Coast to pick me up and take me back to San Diego to join the rest of the family for the balance of the summer break. When the captain heard Dad was coming to pick me up, there was a lot fuss over the lunch menu! Overall, it was a great experience with a fantastic crew. I really bonded with all my shipmates and very much enjoyed the working with and being guided by the Captain, Chief Officer, Third Mate and the British cadets. I now see why my father loves shipping so much! Robert started to educate me on all the different types of bulk carriers, such as the handy size bulkers which are used mainly for smaller ports/rivers. Panamax bulkers are appropriately named as they are the largest bulk carriers able to transit the Panama Canal, whereas the cape-size trade via the Cape of Good Hope. In the tanker trade, Suezmax tankers are the largest size that can go through the Suez canal. He then told me about the very large ore carriers that Vale built which are called Valemax. He showed me a picture of one which is 400,000 dwt and it would make the Saga Andorinha look like a sunfish! Editor’s Note: Mark Conroy, director of athletics, presented the following during Upper School Assembly on November 28, 2012. The primary purpose of our assembly this morning is to review our fall athletic season. Before doing so I wanted to take this opportunity to acknowledge a beloved member of our community, Al Lavalle, who passed away earlier this week. Many of you know that Al worked at Williston for the past 13 years. While he was on the athletic grounds staff the past three years, for the previous 10, Al ran our Cage at the Athletic Center. Al had an incredibly profound impact on everyone who knew him. With all due respect to all of us who work with students on a regular basis here, no one in our community impacted more students than Al during those ten years. I would like to ask all of us to observe a few moments of silence in Al LaValle’s memory. Go to the full list of Fall Team Highlights and Individual Honors. We set sail for Vancouver, Canada and the Second Officer let me take the helm for a few minutes. Not sure how it looked on the chart, but I was nervous and it was certainly a lot harder than it looks! I was taught how to navigate and how to see if we were on course. We were a tad starboard and so we adjusted the navigation to head 341. I did not however, have the chance to learn celestial navigation. The captain had told me this is a requirement, since there has to be a back-up plan should the systems fail. I joined Robert on his watch duty from 2400 hrs to 0600 hrs. 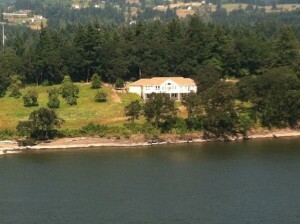 We passed the San Juan Islands and Johns Island where I had spent a month at Camp Norwester a few years ago. In the distance, I could see the teepee tents of the camp. The following dedication by Molly Newton was originally published in The Williston Northampton School 2007 Log. Please and thank you, two simple little words we all could spell by third grade. two simple little words many of us forgot sometime in those long years between third grade and our arrival at Williston; two simple words that Al Lavalle constantly reminded us to say, and never let us get away with forgetting.